I know that I said I would start this week with a For a Song post, but my post festival high said otherwise. 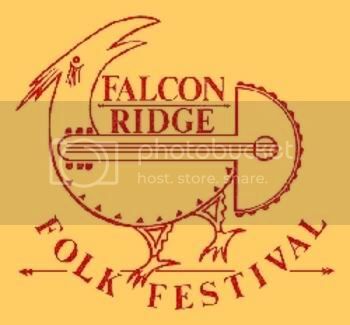 I had a great time at the Falcon Ridge Folk Festival, and I will be doing a series of posts on the wonderful music I found there, including this week’s review. For now, I am presenting a summary of some highlights of my Falcon Ridge experience. Old Crow Medicine Show was not at Falcon Ridge, but Wagon Wheel certainly was, and this is the closest recorded version to what I heard. One thing I have heard about at folk festivals, but never had the chance to enjoy, was the after parties, where musicians gather at a campsite after the scheduled events and play more music. At Falcon Ridge, some of these after parties were organized events that were not on the official schedule, but which offered music that was just as good. The intimate setting of these events made it easy to meet the musicians, including several who I had reviewed but never met before. The first night of the festival, I met Pesky J Nixon at one of these events. The second night, I met Pesky J Nixon again, among others. Can you guess who I saw on the last night? The amazing thing about this was that it happened at three different locations. The last two times I saw them, they closed their set with Wagon Wheel. I hope that they record it some day. It was a pleasure to see Tracy Grammer again. I had only met her once before, at a festival in Philadelphia, back when Dave Carter was still alive. At that time, they were playing a song that was so new that they hadn’t given it a name yet. I spoke to Grammer then, and suggested Open Up Your Gate, but they eventually went with Mother, I Climbed. At Falcon Ridge, I reminded Grammer of this long-ago conversation, and she remembered me. I also got to see The Storycrafters again. I had met them at the Clearwater Festival when my daughter was younger. This time, I was by myself, and some might say that I had no business being in the family music tent. But I love storytelling, and The Storycrafters do it very well indeed. They introduced Beeping Slooty with an apology to the sign-language interpreter for what they were about to make her do, and then thanked her profusely at the end for what she had done. They took Beeping Slooty at a faster pace than on this recording, and this was easily the funniest moment of Falcon Ridge for me. I was a volunteer at Falcon Ridge, and my crew had a mandatory shift on the last day that was supposed to last until 5PM. That meant that I was not going to be able to see John Gorka’s set from the main stage. However, the mandatory shift was for takedown and cleanup, and everyone performed heroically. We finished almost two hours early, and I was able to see Gorka’s set after all, and later meet him. I spent his set in the company of Susan from Star Maker Machine. There were four Star Makers at the festival, including myself, FiL, Boyhowdy, and of course Susan. It was the first time we had all met each other, and it was everything I hoped it would be. Gorka opened his set with I’m From New Jersey. I am from New Jersey, so this song is a particular favorite of mine. Darius, Pesky J. Nixon has recorded "Wagon Wheel." It's on their debut CD--"Good Grief" and they're accompanied by Eric Lee and Anthony da Costa as well. Thanks Kathy! Ethan from PJN here. Actually I don't think Anthony is on that recording, but Andrea Coller, a brilliant songwriter who passed away two years ago is. Wagon Wheel is the "ghost" track from our first record. Because we didn't write it, we didn't put it up on iTunes. I will add it to our free download section of our webpage for you. Its a rough live recording - maybe one day we'll give it the studio treatment. Darius, if you had stopped by my campsite at the right time, you would have heard me playing "Wagon Wheel", too. What a great song! And a fun one to play, too.